This is a most interesting and surprisingly spacious 2/3 bedroom end back-to-back terrace nicely positioned on the off road side with pleasant hillside views. The property has recently been updated including the installation of a new kitchen. FULL DESCRIPTION This is a most interesting and surprisingly spacious 2/3 bedroom end back-to-back terrace nicely positioned on the 'off road' side with pleasant hillside views. The property has recently been updated including the installation of a new kitchen. There is a good amount of accommodation, which extends at first floor level over the passageway, and briefly comprises hallway, lounge, kitchen, cellar, 2 double bedrooms on the first floor with a spacious bathroom that has access to a staircase which rises to a huge and nicely presented attic room. The property has gas fired central heating, and double glazing throughout. Externally, there is a small lawned garden area, and a stone-built outhouse. It is conveniently placed within a short walk of the village centre, nearby bus stop with regular service, and still within walking distance of the train station. HALLWAY With staircase rising to the first floor, wall mounted coat hooks, and painted timber floorboards with central matwell. LOUNGE 15' 1" x 12' 2" (4.6m x 3.71m) There is a gas fire with timber surround and tiled hearth. The large window provides pleasant views across the valley. KITCHEN 15' 1" x 6' 3" (4.6m x 1.91m) Recently refitted with a nice range of base units having butcher's block work surfaces over incorporating a 1½ bowl stainless steel sink with mixer tap. There are tiled splashbacks, space for a cooker and fridge/freezer, along with space and plumbing for a washing machine. The kitchen window also provides those hillside views, and there is access to the basement. 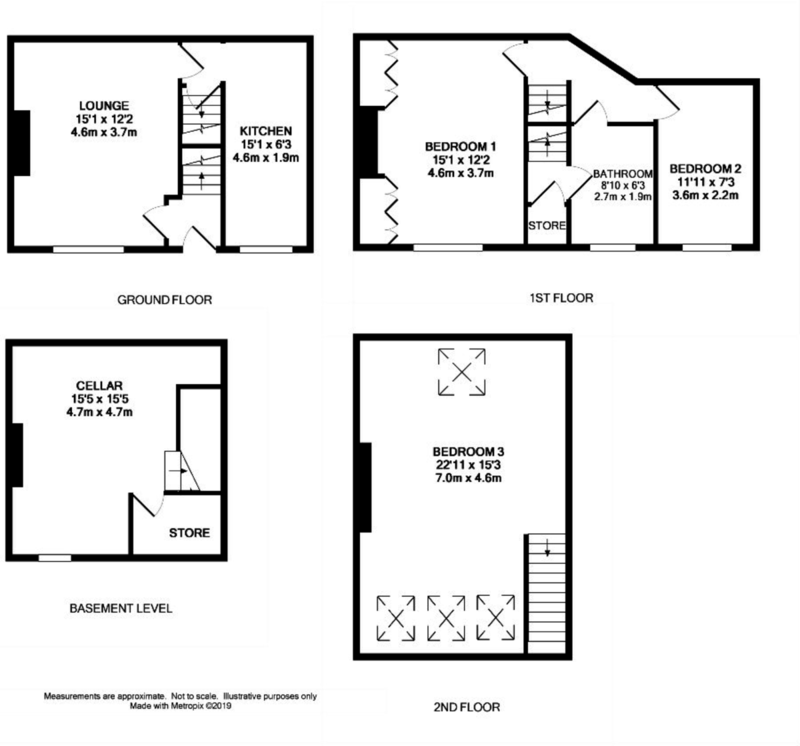 BASEMENT 15' 5" x 15' 5" (4.7m x 4.7m) The basement is a useful space offering future potential to convert. There is some natural light, power, lighting, and water supply, along with a stone flagged floor and a small fuel store. BEDROOM 1 15' 1" x 12' 2" (4.6m x 3.71m) A good sized double bedroom being fitted with a range of wardrobes and cupboards. A large window provides those lovely views across the valley. BEDROOM 2 11' 11" x 7' 3" (3.63m x 2.21m) A double or large single bedroom also enjoying the views. BATHROOM 8' 10" x 6' 3" (2.69m x 1.91m) A sizeable bathroom fitted with a modern white suite comprising bath set in a tiled surround, separate quadrant shower cubicle with mains shower over, pedestal wash basin, and a low flush w.c. There are part tiled walls, a frosted window, and a door off the bathroom leads to an inner lobby where you will find a linen cupboard which also houses the central heating boiler. A staircase then rises from the inner lobby to the attic room above. ATTIC ROOM 22' 11" x 15' 3" (6.99m x 4.65m) What a great surprise! This is a huge room which is currently used as a bedroom but does provide scope for many other purposes. It features an exposed painted brickwork chimney breast with a small cast iron bedroom fireplace and painted timber surround. There are painted beams and roof timbers, access to eaves storage, and plenty of natural light is provided by 4 velux roof windows. OUTSIDE The property is approached through a passageway which then opens to the rear of the terrace. There is a small lawned area in front of the house, and access to an outhouse/former w.c. LOCATION Park View is a row of terraced properties just opposite the park on Manchester Road. No.2 is located at the rear and accessed through the passageway between no.1 and Sherbrooke Cottages.